The 2014 Chevrolet Impala has received the highest possible five-star Overall Vehicle Score for safety as part of the National Highway Traffic Safety Administration’s New Car Assessment Program. The redesigned, full-size sedan presents one of the most comprehensive collections of standard and available safety features in the segment. It employs advanced technologies – including radar – to help avoid crashes. Visual and audible alerts, depending on the alert feature, help drivers identify potential crash situations and even intervene when a crash threat appears more imminent. The alerts are designed to identify potential threats with sufficient warning to give the driver time to react and make changes. Full-speed-range adaptive cruise control – Radar technology senses traffic in front of the Impala to adjust vehicle speed, including stopping the vehicle in heavy traffic and accelerating again. It is the first application in a Chevrolet. 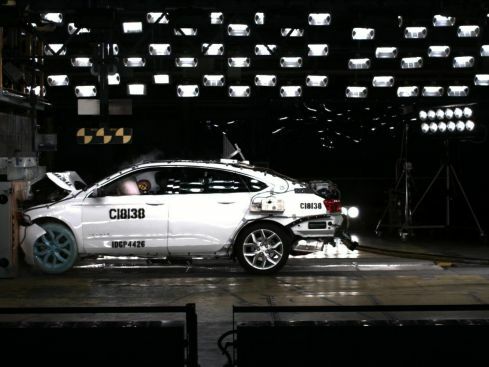 Crash imminent braking – Another Chevy first: Radar technology detects a possible crash threat and alerts the driver. If the driver does not appear to react quickly enough or doesn’t react at all, this feature intervenes to apply the brakes in an effort to avoid the crash. Forward collision alert – Camera technology detects a possible crash threat and alerts the driver, giving him or her time to stop and/or change course. Lane departure warning – A camera-based lane detection system warns the driver of unsignaled lane changes. The camera, mounted near the inside rearview mirror, identifies traffic lane markings and provides audible alerts. Side blind zone alert – Using radar sensors on both sides of the vehicle, the system “looks” for other vehicles in the blind zone areas of the Impala and indicates their presence with light-emitting diode, or LED-lit symbols in the outside mirrors. Rear cross traffic alert – Based on the radar sensors of side blind zone alert, it warns the driver of vehicles in traffic when backing out of a parking spot – including angled parking. Visual and audible alerts are triggered if moving vehicles are detected. Rear vision camera with dynamic guidelines – With a display in the center stack infotainment system, the camera provides a view of objects directly behind the Impala, while the dynamic guidelines provide a reference that helps make parking and other maneuvers easier. Ultrasonic rear park assist – Uses sensors in the rear bumper to detect objects directly behind the vehicle and alerts the driver. Brake pre-fill feature – To quicken the response time of the brakes and help shorten stopping distances, this features “loads” the brake calipers in anticipation of hard braking by slightly increasing the hydraulic pressure in the brake lines whenever the driver lifts off the accelerator pedal. This feature is included on models equipped with adaptive cruise control and collision mitigation braking. Hill hold/start assist – Applies the brakes for about 1.5 seconds to prevent roll-back when the driver moves his or her foot from the brake to the accelerator pedal. Impala also employs systems that enable greater vehicle control, including standard StabiliTrak electronic stability control system, all-speed traction control, four-wheel disc brakes with four-channel antilock brakes and electronic brake force distribution, which ensures optimal braking force at both axles for maximum stability under heavy braking. The 2014 Corvette Stingray will deliver up to an EPA-estimated 17 miles per gallon in the city, and 29 mpg on the highway, making the new Stingray the most fuel efficient sports car on the market as no other car offers more than 455 horsepower and greater than 29 mpg highway. The EPA estimate of 17 city and 29 highway is for the Corvette Stingray equipped with an all-new, seven-speed manual transmission. The estimate reflects an average of fuel economy in both the default “Tour” mode, which delivers 28 mpg highway, and driver-selectable “Eco” mode, which delivers 30 mpg highway. For Stingrays equipped with the seven-speed manual transmission, Eco mode enables Active Fuel Management, which disables four of the cylinders for improved fuel economy during light engine loads. For Corvette Stingrays equipped with the six-speed automatic, Active Fuel Management is active in all drive modes until the driver engages the manual-shift mode using the steering-wheel paddles. Fuel economy estimates for Corvette Stingrays equipped with the six-speed automatic will be finalized soon. The highway rating represents an 11-percent increase in fuel economy over the previous Corvette, while the all-new 6.2L LT1 V-8 delivers 455 horsepower, a 6-percent increase over the previous Corvette. The LT1 delivers 460 horsepower with the available dual-mode exhaust. By comparison, the Porsche 911 Carrera S delivers 400 horsepower, and an EPA-estimated 27 mpg highway. Sports cars with more than 455 horsepower typically offer significantly lower highway fuel economy estimates than the Corvette Stingray. For example, the Jaguar F-Type S offers 495 hp and 23 mpg highway while the Audi R8 V10 offers 510 hp and 19 mpg highway. Sports cars that deliver more than 29 mpg highway based on EPA estimates typically deliver significantly less engine output. For example, the Porsche Cayman offers 30 mpg and 275 hp while the BMW Z4 sDrive28 delivers 34 mpg and 241 hp. 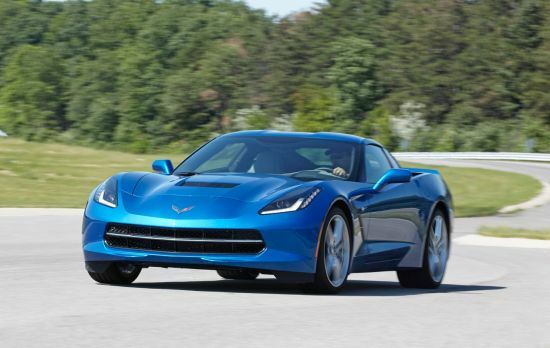 The 2014 Corvette Stingray coupe goes on sale this fall, with a convertible following by the end of the year.